Dominated by steep rocky headlands and exposed to the ferocious force of the wind off the Bass Strait, the Pinnacles at Cape Woolamai in Phillip Island in Victoria, Australia is an absolute treasure for landscape photographers. The area not only allows for spectacular grand vistas to be captured with the beautiful warm light of a setting sun to the west but also enables the creative landscape photographer to capture the smaller details, textures and patterns of the landscape made ever more evident by the low directional light at sunset. This image belongs to the travel and nature stock photo library. This stock photo of The Pinnacles at Sunset is available for licensing for commercial and editorial uses including websites, blogs, books, magazines, brochures and advertising. Restrictions may apply for images which contain third party copyrighted material or sensitive subjects. Photos of artwork are for editorial use only. 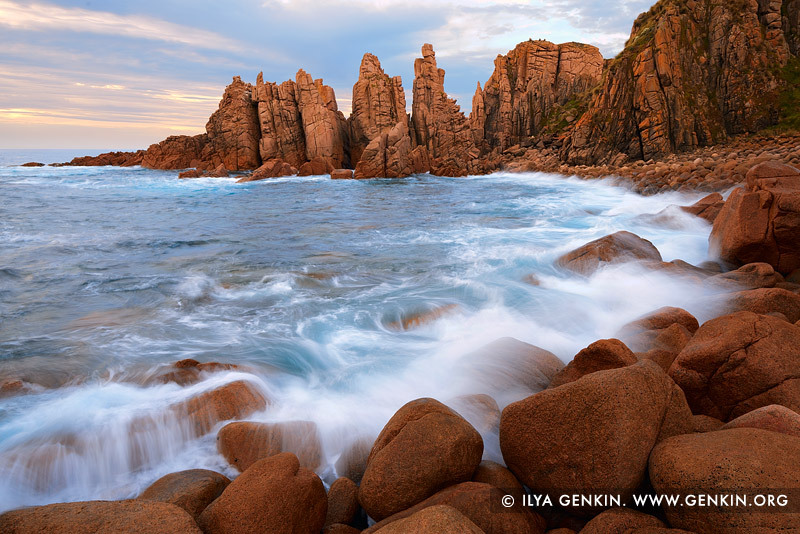 This image id AU-CAPE-WOOLAMAI-0001 of The Pinnacles at Sunset, is copyrighted © by Ilya Genkin. This is not a public domain image.